Saucon Mennonite Church (Alliance of Mennonite Evangelical Congregations), formerly a member of the General Conference Mennonite Church and its Eastern District Conference, is located on the Old Bethlehem Pike between Coopersburg and Center Valley, Pennsylvania, in Upper Saucon Township, Lehigh County. The first meetinghouse, a log building, was erected in 1735-38. It had one room for the church and one room for the church school, separated by a swinging partition. In 1749 the following trustees were appointed to build another meetinghouse: George Bachman, Philip Geissinger, John Rieser, Samuel Newcomer, and Samuel Bechtel. The deed, dated 1751, is well preserved. More than a dozen Indians worshiped regularly in the services. In 1782 a schoolhouse was built on the grounds near the highway. It was abandoned when the Penn Schoolhouse, a public school, was built by the township. In 1847 (1841?) a beautiful stone meetinghouse replaced the old building. An addition to the building occurred in 2000. In the Oberholtzer division of 1847 in the Franconia Conference most of the Saucon members followed John H. Oberholtzer, so that the congregation became a charter member of the Eastern District Conference. The small group which stayed with the old conference continued to use the meeting house for some years. The last resident Franconia Conference minister who preached to the small Mennonite Church (MC) flock at Saucon was Samuel Moyer (1806-1877); he himself first went with the majority into the new conference, but returned to the Franconia Conference about 1861. The last MC member died in 1899. In 1957 the pastor of the Saucon church was M. Lawrence Smith, and the membership was 64. In 2009 the pastor was Steve Strunk. Wenger, J. C. History of the Mennonites of the Franconia Conference. Telford, 1937: 224 ff. Sprunger, Samuel F. and John C. Wenger. "Saucon Mennonite Church (Coopersburg, Pennsylvania, USA)." Global Anabaptist Mennonite Encyclopedia Online. August 2010. Web. 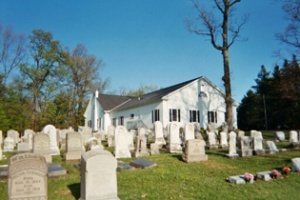 21 Apr 2019. http://gameo.org/index.php?title=Saucon_Mennonite_Church_(Coopersburg,_Pennsylvania,_USA)&oldid=140788. Sprunger, Samuel F. and John C. Wenger. (August 2010). Saucon Mennonite Church (Coopersburg, Pennsylvania, USA). Global Anabaptist Mennonite Encyclopedia Online. Retrieved 21 April 2019, from http://gameo.org/index.php?title=Saucon_Mennonite_Church_(Coopersburg,_Pennsylvania,_USA)&oldid=140788.